DU Admission 2019: DU provides admission into various UG and PG courses such as B.Sc, B.Com, B.A, M.Sc, B.Ed, M.A, M.Com, M.Phil, BBA, MBA, BCA, MCA, LLB, etc. through Entrance exam or Merit-Based Admission procedure. Delhi University is one of the most popular and reputed universities of India. For Admission into MBA candidates have to Apply for CAT as well as DU Admission. 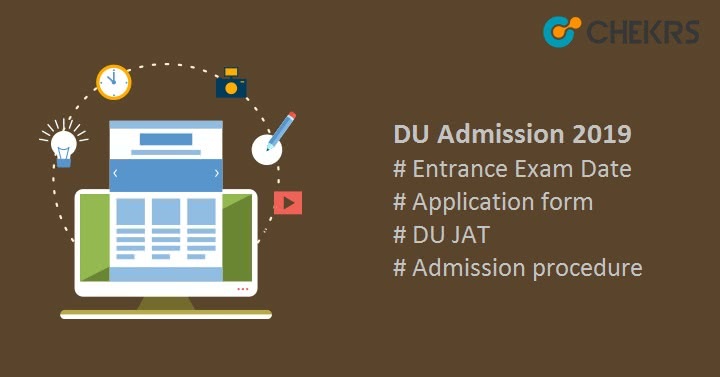 DU Admission 2019 will be done through the Entrance exam ( For UG Management: DU JAT) or qualifying Exam’s Merit List. In this article, we are providing all the information related to DU Admission such as DU Admission Form, Procedure, Admission Procedure, Exam dates etc. We are also Including DU JAT 2019 in this article which provides Admission into BBS/ BBA / BMS / BFIA courses into the afflicted colleges. For UG Courses Must have qualified 12th or equivalent examination with Physics, Chemistry, Biology/ Math. Must have qualified any of the UG degree courses in the related discipline, from a recognized university/institute. They also need to qualify the exam with at least 50% Marks. Appeared in GMAT/ CAT/ XAT/ MAT. Foreign Candidates can also apply. Foreign candidates who have completed Schooling in India will be considered as a foreign candidate and can apply for 3% Quota. DU Admission Process will be done in the between the month of March to July. The official dates will be announced with the release of Official DU admission Notification.Until than here is the table of Tentative DU Admission 2019 Dates. First of all, Du doesn’t conduct entrance exam for providing admission into some of the UG and PG courses. For Example, DU MBA Admission Will be provided on the basis of CAT Score. To Shortlist the candidates they consider Their CAT Rank card and performance in Degree Course with Performance on Admission Procedure which consists GD and PI. On the other hand, It conducts DU JAT 2019 for Providing Admission into BBA. Admission into LLB is done on the basis of DU LLB Entrance Exam 2019 Score Card and some Pre-Admission/Counselling Procedures. In the table below we are providing summarize procedure for both mode of DU Admission. All the Candidates need to fill the application Form for the Admission and Entrance exam. The online Application form will be available for UG courses merit-based admission from June 2019. The DU Application Form for UG courses entrance exam based admission will available from May 2019. The registration for PG courses admission will be started from April 2016. Candidate can fill the application form through online mode. We are sharing summarized procedure to fill and submit the DU Admission Form. All the candidates have to first Visit the official website. Then they need to registration by filling all the asked details and finally submit the form. After it Candidates need to login to the same website using the login details which they have submitted /Received in the Email. After logging in fill the application form. After it, Pay the DU Application Fee and submit all the forms. The DU Registration For Fee for MBA (HRD/IB) courses is Rs 350/- for SC/ ST / PWD. We are providing Exam Pattern for DU JAT 2019 which provides Admission into BBS/ BBA / BMS / BFIA courses into the afflicted colleges. We will include Exam pattern for other offered cources later. If there is no Entrance exam then there will be no syllabus. Now For UG Courses there is DU JAT so Here is the DU JAT Syllabus 2019. The Admit Card will be Available for the entrance exam on the official website. Candidates have to visit the official website to download the DU Admission Hall ticket. Candidates also need to keep it safe and bring it to the examination center for verification. Candidates will be not allowed to appear in the examination without Admit card. DU will also release Answer key after the Examination. The answer key will be available on the official website. The candidate has to Visit the official site and then click on Undergraduate Admissions, Now after it click on DU JAT Master Question Papers with Answers. After it the answer key will appear on the screen. Download it. Du Admission Result will be declared for all the candidates who appeared in the Entrance exam. The result will be also uploaded on the official website. The Admission and Exam Authority will also prepare and release DU Admission Merit List for both modes of admission. For Admission, through Entrance exam, there will be a merit list of Qualified candidates who obtained more than the cut-off marks. The other merit list will be made for courses which do not require DU Admission Entrance Exam. In this mode, the Merit list will be prepared on the Scorecard of GMAT/ CAT/ XAT/ MAT. After it, Candidate will be called of Counselling/Admission Round on the basis of the DU Admission Merit list. Candidates who have qualified the Du Entrance exam will get admission after Choice filling, Seat allotment, and Document verification. While on the other hand Candidates who applied for admission after qualifying another exam will be shortlisted on the basis of Scorecard and other Eligibility Criteria For GD/PI round For DU Admission To MBA (BE) and MBA (FM) and other similar courses. All the Selected candidates have to take part in this admission round like GD and PI ­­­­Process.